Last week I wrote about the sudden increase in stock market volatility as an illustration of why the efficient market hypothesis (EMH) is not entirely accurate. I focused on the empirical argument made by Robert Shiller that the observed volatility of stock prices is greater than the volatility implied by the proposition that stock prices reflect rational expectations of future dividends paid out by the listed corporations. I made two further points about EMH: a) empirical evidence cited in favor of EMH like the absence of simple trading rules that would generate excess profits and the lack of serial correlation in the returns earned by asset managers is also consistent with theories of asset pricing other than EMH such as Keynes’s casino (beauty contest) model, and b) the distinction between fundamentals and expectations that underlies the EMH model is not valid because expectations are themselves fundamental owing to the potential for expectations to be self-fulfilling. Scott responded to my criticism by referencing two of his earlier posts — one criticizing the Keynesian beauty contest model, and another criticizing the Keynesian argument that the market can stay irrational longer than any trader seeking to exploit such irrationality can stay solvent – and by writing a new post describing what he called the self-awareness of markets. Let me begin with Scott’s criticism of the beauty-contest model. I do so by registering my agreement with Scott that the beauty contest model is not a good description of how stocks are typically priced. As I have said, I don’t view EMH as being radically wrong, and in much applied work (including some of my own) it is an extremely useful assumption to make. But EMH describes a kind of equilibrium condition, and not all economic processes can be characterized or approximated by equilibrium conditions. So my disagreement with Scott about the beauty-contest theory of stock prices as an alternative to EMH is relatively small. My main reason for mentioning the beauty-contest theory was not to advocate it but to point out that the sort of empirical evidence that Scott cites in support of EMH is also consistent with the beauty-contest theory. As Scott emphasizes himself, it’s not easy to predict who judges will choose as the winner of the beauty contest. And Keynes also used a casino metaphor to describe stock pricing in same chapter (12) of the General Theory in which he developed the beauty-contest analogy. However, there do seem to be times when prices are rising or falling for extended periods of time, and enough people, observing the trends and guessing that the trends will continue long enough so that they can rely on continuation of the trend in making investment decisions, keep the trend going despite underlying forces that eventually cause a price collapse. Let’s turn to Scott’s post about the ability of the market to stay irrational longer than any individual trader can stay solvent. The markets can stay irrational for longer than you can stay solvent. Thus people who felt that tech stocks were overvalued in 1996, or American real estate was overvalued in 2003, and who shorted tech stocks or MBSs, might go bankrupt before their accurate predictions were finally vindicated. There are lots of problems with this argument. First of all, it’s not clear that stocks were overvalued in 1996, or that real estate was overvalued in 2003. Lots of people who made those claims later claimed that subsequent events had proven them correct, but it’s not obvious why they were justified in making this claim. If you claim X is overvalued at time t, is it vindication if X later rises much higher, and then falls back to the levels of time t? The first thing to note is that the term ‘bubble’ implies asset mis-pricing that is easily observable. A positive bubble is when asset prices are clearly irrationally high, and a negative bubble is when asset price are clearly irrationally low. If these bubbles existed, then investors could earn excess returns in a highly diversified contra-bubble fund. At any given time there are many assets that pundits think are overpriced, and many others that are seen as underpriced. These asset classes include stocks, bonds, foreign exchange, REITs, commodities, etc. And even within stocks there are many different sectors, biotech might be booming while oil is plunging. And then you have dozens of markets around the world that respond to local factors. So if you think QE has led Japanese equity prices to be overvalued, and tight money has led Swiss stocks to be undervalued, the fund could take appropriate short positions in Japanese stocks and long positions in Swiss stocks. I think that Scott is conflating a couple of questions here: a) is EMH a valid theory of asset prices? b) are asset prices frequently characterized by bubble-like behavior? Even if the answer to b) is no, the answer to a) need not be yes. Investors may be able, by identifying mis-priced assets, to earn excess returns even if the mis-pricing doesn’t meet a threshold level required for identifying a bubble. But the main point that Scott is making is that if there are a lot of examples of mis-pricing out there, it should be possible for astute investors capable of identifying mis-priced assets to diversify their portfolios sufficiently to avoid the problem of staying solvent longer than the market is irrational. That is a very good point, worth taking into account. But it’s not dispositive and certainly doesn’t dispose of the objection that investors are unlikely to try to bet against a bubble, at least not in sufficient numbers to keep it from expanding. The reason is that the absence of proof is not proof of absence. That of course is a legal, not a scientific, principle, but it expresses a valid common-sense notion, you can’t make an evidentiary inference that something is not the case simply because you have not found evidence that it is the case. So you can’t infer from the non-implementatio of the plausible investment strategies listed by Scott that such strategies would not have generated excess returns if they were implemented. We simply don’t know whether they would be profitable or not. In his new post Scott makes the following observation about what I had written in my post on excess volatility. I may hold a very optimistic view about the state of the economy today. But suppose that I wake up tomorrow and hear that the Shanghai stock market crashes, going down by 30% in one day. Will my expectations be completely independent of my observation of falling asset prices in China? Maybe, but what if I hear that S&P futures are down by 10%? If other people start revising their expectations, will it not become rational for me to change my own expectations at some point? How can it not be rational for me to change my expectations if I see that everyone else is changing theirs? So, like Scott, I am saying that it is rational for people to revise their expectations based on new information that there has been a stock crash. I guess what Scott meant to say is that my argument, while valid, is not an argument against EMH, because the scenario I am describing is consistent with EMH. But that is not the case. Scott goes on to provide his own example. All citizens are told there’s a jar with lots of jellybeans locked away in a room. That’s all they know. The average citizen guesstimates there are 453 jellybeans in this mysterious jar. Now 10,000 citizens are allowed in to look at the jar. They each guess the contents, and their average guess is 761 jellybeans. This information is reported to the other citizens. They revise their estimate accordingly. But there’s a difference between my example and Scott’s. In my example, the future course of the economy depends on whether people are optimistic or pessimistic. In Scott’s example, the number of jellybeans in the jar is what it is regardless of what people expect it to be. The problem with EMH is that it presumes that there is some criterion of efficiency that is independent of expectations, just as in Scott’s example there is objective knowledge out there of the number of jellybeans in the jar. I claim that there is no criterion of market efficiency that is independent of expectations, even though some expectations may produce better outcomes than those produced by other expectations. I wasn’t planning to post today, but I just saw (courtesy of the New York Times) a classic example of the economic prejudice wrapped in high-minded sloganeering that I talked about yesterday. David Rocker, founder and former managing general partner of the hedge fund Rocker Partners, proclaims that he is in favor of a free market. The worldwide turbulence of recent days is a strong indication that government intervention alone cannot restore the economy and offers a glimpse of the risk of completely depending on it. It is time to give the free market a chance. Since the crash of 2008, governments have tried to stimulate their economies by a variety of means but have relied heavily on manipulating interest rates lower through one form or other of quantitative easing or simply printing money. The immediate rescue of the collapsing economy was necessary at the time, but the manipulation has now gone on for nearly seven years and has produced many unwanted consequences. In what sense is the market less free than it was before the crash of 2008? It’s not as if the Fed before 2008 wasn’t doing the sorts of things that are so upsetting to Mr. Rucker now. The Fed was setting an interest rate target for short-term rates and it was conducting open market purchases (printing money) to ensure that its target was achieved. There are to be sure some people, like, say, Ron Paul, that regard such action by the Fed as an intolerable example of government intervention in the market, but it’s not something that, as Mr. Rucker suggests, the Fed just started to do after 2008. And at a deeper level, there is a very basic difference between the Fed targeting an interest rate by engaging in open-market operations (repeat open-market operations) and imposing price controls that prevent transactors from engaging in transactions on mutually agreeable terms. Aside from libertarian ideologues, most people are capable of understanding the difference between monetary policy and government interference with the free market. So what really bothers Mr. Rucker is not that the absence of a free market, but that he disagrees with the policy that the Fed is implementing. He has every right to disagree with the policy, but it is misleading to suggest that he is the one defending the free market against the Fed’s intervention into an otherwise free market. When Mr. Rucker tries to explain what’s wrong with the Fed’s policy, his explanations continue to reflect prejudices expressed in high-minded sloganeering. First he plays the income inequality card. The Federal Reserve, waiting for signs of inflation to change its policies, seems to be looking at the wrong data. . . .
Low interest rates have hugely lifted assets largely owned by the very rich, and inflation in these areas is clearly apparent. Stocks have tripled and real estate prices in the major cities where the wealthy live have been soaring, as have the prices of artwork and the conspicuous consumption of luxury goods. Now it may be true that certain assets like real estate in Manhattan and San Francisco, works of art, and yachts have been rising rapidly in price, but there is no meaningful price index in which these assets account for a large enough share of purchases to generate a significant inflation. So this claim by Mr. Rucker is just an empty rhetorical gesture to show how good-hearted he is and how callous and unfeeling Janet Yellen and her ilk are. He goes on. 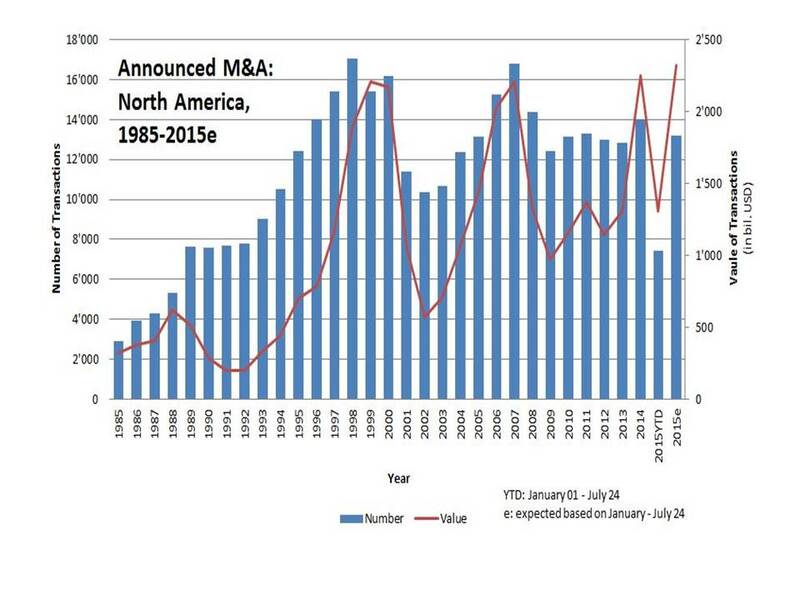 Cheap financing has led to a boom in speculative activity, and mergers and acquisitions. Most acquisitions are justified by “efficiencies” which is usually a euphemism for layoffs. Valeant Pharmaceuticals International, one of the nation’s most active acquirers, routinely fires “redundant” workers after each acquisition to enhance reported earnings. This elevates its stock, with which it makes the next acquisition. With money cheap, corporate executives have used cash flow to buy back stock, enhancing the value of their options, instead of investing for the future. This pattern, and the fear it engenders, has added to downward pressure on employment and wages. Actually, according to data reported by the Institute for Mergers and Acquisitions and Alliances displayed in the accompanying chart, the level of mergers and acquisitions since 2008 has been consistently below what it was in the late 1990s when interest rates were over 5 percent and in 2007 when interest rates were also above 5 percent. And if corporate executives are using cash flow to buy back stock to enhance the value of their stock options instead of making profitable investments that would enhance share-holder value, there is a serious problem in how corporate executives are discharging their responsibilities to shareholders. Violations of management responsibility to their shareholders should be disciplined and the legal environment that allows executives to disregard shareholder interests should be reformed. To blame the bad behavior of corporate executives on the Fed is a total distraction. Having just attributed a supposed boom in speculative activity and mergers and acquisitions to the Fed’s low-interest rate policy, Mr. Rucker, without batting an eye, flatly denies that an increase in interest rates would have any negative effect on investment. The Fed should raise rates in September. The focus on a quarter-point change in short rates and its precise date of imposition is foolishness. Expected rates of return on new investments are typically well above 10 percent. No sensible businessman would defer a sound investment because short-term rates are slightly higher for a few months. They either have a sound investment or they don’t. Let me repeat that. “Expected rates of return on new investment are typically well above 10 percent.” I wonder what Mr. Rucker thinks the expected rate of return on speculative activity and mergers and acquisitions is. But, almost despite himself, Mr. Rucker is on to something. Some long-term investment surely is sensitive to the rate of interest, but – and I know that this will come as a rude shock to adherents of Austrian Business Cycle Theory – most investment by business in plant and equipment depends on expected future sales, not the rate of interest. So the way to increase investment is really not by manipulating the rate of interest; the way to increase investment is to increase aggregate demand, and the best way to do that would be to increase inflation and expected inflation (aka nominal GDP and expected nominal GDP).